Putin’s aggression in Ukraine has sent shock waves throughout Europe, including the Balkans, a long-standing target of Russian imperialism. Since 2000, if not earlier Moscow has deployed in the Balkans all the instruments of power: military – by occupying Transnistria, the Black Sea coast, and Crimea, and requesting bases in Serbia and Montenegro – information by its multiple forms of information warfare, buying of media bosses and/or media control - economics – through energy coercion and other corrupt deals - and diplomatic activity to obstruct resolution of all the issues left over form the post-Yugoslavia wars. Russian ambassadors to Balkan states also habitually publicly assert their right to intervene in their hosts’ domestic politics., demonstrating their contempt for those countries’ sovereignty and territorial integrity. In addition Moscow constantly strives to corrupt and subvert Balkan political movements, leaders, and parties. Russian pressure even led Bulgaria’s Ministry of Defense in 2014 to offer a report calling it a threat to Bulgarian security. 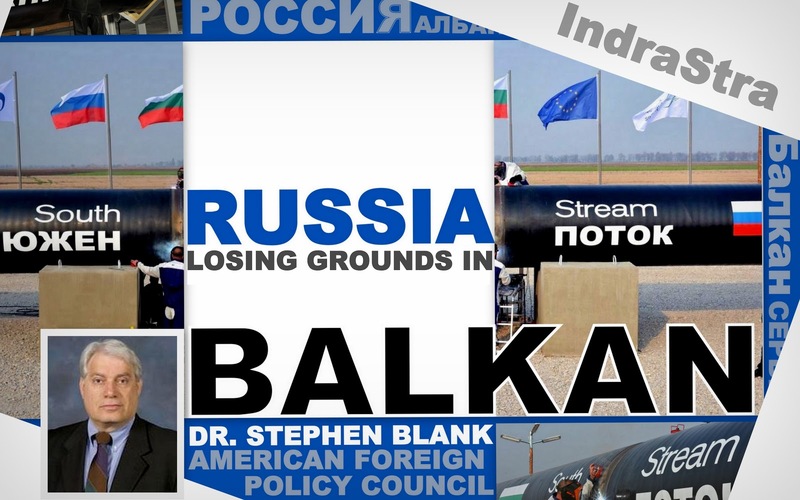 Nevertheless Moscow now confronts serious internal as well as Western resistance to its Balkan policies. In Macedonia, the discredited government’s wire-tapping scandal triggered mass demonstrations. Simultaneous manifestations of Albanian-Macedonian ethnic tensions and violence also underscored the fragility of the Gruevski government’s legitimacy and governance. 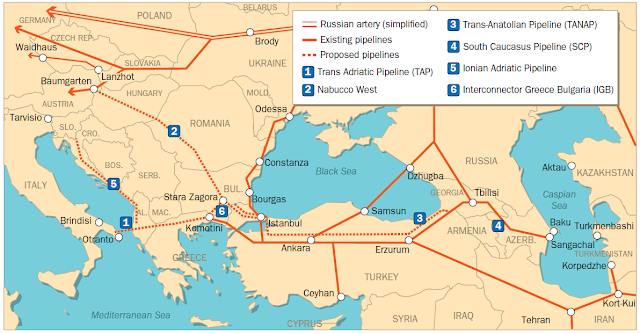 But since Macedonia is the most likely route for Moscow’s newly projected Turkstream pipeline that would bring Russian gas to the Turco-Greek border and from there to the Balkans, Moscow immediately ascribed the unrest to a Western plot against Russia and the pipeline. Meanwhile Moscow is pressuring Greece not to sell its domestic gas distribution company, DESFA, to Azerbaijan because that would facilitate the Azeri-Turkish project to bring Azeri gas through Turkey (Trans-Anatolian Pipeline or TANAP) and then to the Trans-Adriatic Pipeline to Albania and then Italy if not Serbia). Curtailing the TANAP-TAP project would give Rusia a monopoly in the Balkans and block the EU-US projected Southern gas corridor that would integrate Azerbaijan and potentially Central Asian gas producers with the European market and bypass Moscow’s predatory energy policies. Moscow’s arrogance is such that it has already announced it will begin constructing the pipes for the projected Turkstream project to replace the abandoned and uneconomical South Stream project even though the papers for doing so have not been submitted or authorized. Thus apart from threatening Turkey in the Black Sea, it is attempting to coerce it into accepting this pipeline without proper feasibility studies or financing. But given Moscow’s desperate need for energy customers, it is unlikely that Russia can coerce Turkey into accepting Russia’s terms on this pipeline even if Ankara agrees to build that pipeline. Indeed, in the early negotiations last year on Turkstream Moscow had to accept Turkish demands for a substantially reduce price for its gas, signifying who really has the upper hand here. Elsewhere too Russia’s high-handed policies have triggered strong counter-pressure. US and EU pressure on Greece not to surrender to Russian blandishments is strong, and Serbia, who was left in the lurch by Moscow’s surprise abandonment of South Stream, has announced its willingness and readiness to buy U.S. natural gas thereby infuriating Russia. Despite a large pro-Russian domestic faction, Belgrade is also moving steadily towards joining the EU, a process that necessitates coming to terms with Kosovo and Bosnia, exactly what Moscow strives to block. Serbian diplomats also report that Serbia’s military would welcome a NATO decision to consider it for a Membership Action Plan (MAP) for NATO, another move that would infuriate Moscow. Finally in Macedonia, the EU, presumably backed by Washington, has brokered a deal to arrange for early elections thereby calming the uproar created by the wiretapping scandal and violent ethnic incidents. Thus in Macedonia, Greece, Serbia, and Turkey the West has pushed back against Russian energy and diplomatic pressures while militarily the US and NATO are challenging Russia in the Black Sea by holding exercises with the Ukrainian Navy and establishing bases in Romania. To stabilize the Balkans, however, NATO and the EU must move further. The EU and NATO must find a viable growth model for Greece to propel it out of its long-term crisis, facilitate construction of inter-connectors spanning the Balkans and Eastern Europe to bring alternative sources of gas to the Balkans, encourage encouraging Serbia’s march to European integration, realign with Turkey on energy and defense issues, and help improve domestic governance throughout the Balkans. Balkan defects in governance and ethnic tensions provide Russia with opportunities for destabilizing the Balkans and derailing European integration. But to the extent that the West resolutely confronts those problems it can contain and even possibly reverse the Russian threat thereby strengthening European integration and security.